Shotokan (松濤館) is a style of karate, developed from various martial arts by Gichin Funakoshi (1868–1957) and his son Gigo (Yoshitaka) Funakoshi (1906–1945). Karate is a martial art that can be practiced by anyone, regardless of age or gender, and can be undertaken at any time during a person’s life. The training system employed in karate comprises three main areas: kihon (basics), kumite (sparring), and kata (forms). It is involving a variety of techniques, including blocks, strikes evasions, throws, and joint manipulations. Karate means “empty hand.” Adding the suffix “-do” (pronounced “doe”), meaning “way,” i.e., karate-do, implies karate as a total way of life that goes well beyond the self-defense applications. In traditional karate-do, we always keep in mind that the true opponent is oneself. Our programs will improve your child’s performance in other sports as well as improving study habits and increasing overall concentration. To build self-confidence, self-respect, and self-discipline, and helping young people to deal with the many problems they face growing up in today’s world. In our young & adult programs you will experience a unique approach to self-defense and exercise that benefits the body and the mind. To strengthen your body, you will begin with isometric and dynamic tension exercises. Flexibility will be enhanced through a gradual building process of safe and easy stretching techniques. You will find that the breathing and concentration exercises sharpen your senses and reflexes while allowing you to relax from the stress of daily life. This unique combination of using the power of the body and of the mind is the key to increased energy, self-discipline, and fitness for a longer happier life. These qualities are essential in recognizing and handling self-defense situations, as well as mental stress. Kumite (sparring) is an important aspect of karate training for kids (and adults) because it gives experience in two critical areas: timing and distance. The full range of karate techniques can be practiced through kata, or prearranged exercises, but kata cannot teach timing or distance. Sparring practice is therefore highly recommended if karate is to be practical for real self-defense, and most kids soon learn to enjoy it. According to tournament rules, “light contact” is also mandated, and no face contact at all is permitted. Sensei works closely with his young students to help them get used to the moving around, the footwork, the straight-line punches (no “haymakers”), the blocking and the strategies used in karate fighting. He also helps them learn the details of point-fighting for tournaments, and the Japanese terminology that referees will use. Weapons training at BMAF is open to Intermediate levels and higher. In this class students will learn basic to advanced techniques with their weapon of Arnis Sticks / Nunchucks. Students also have time in this class to work on Padded Weapon Sparring with their class mates. Training in weapons allows our students to broaden their Martial Arts skills and challenge themseleves. 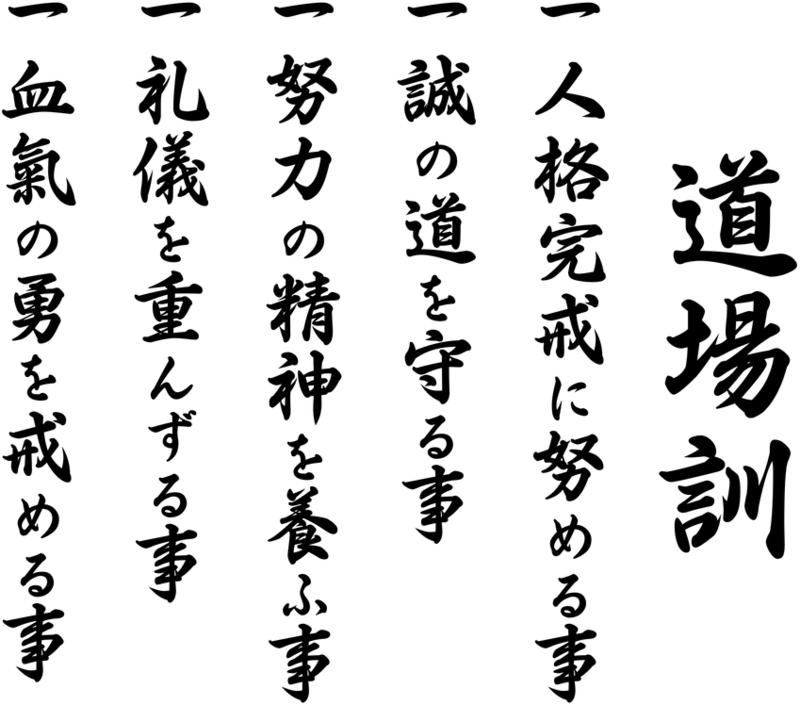 At the end of each training, we recite our “Dojo Kun” which states the basic philosophy of karate according to Master Gichin Funakoshi. Master Funakoshi believed that the dojo kun should be not only a set of rules for conduct in the dojo, but also a guide to everyday life.